As of next Friday, I will have unmitigated gall. That is, my gall will no longer be mitigated on its progress from my liver to my intestines, as the mitigating gall bladder will have been removed. I had a sonogram yesterday. Besides confirming that I have stones and sludge, the radiologist told me that I have a "phyrigian cap" - an anatomical variant of my gall bladder. See that nice Greek bust? 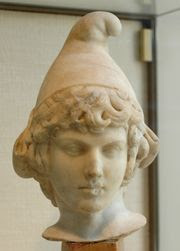 He has a Phrygian cap too. Hope it goes well. Is this a full blown surgery? How long will you be in for?! omg good luck!!! i hope this is all relieved soon. Stones and Sludge? Sounds like a rock concert! Be well. Interesting where they get these terms...okay more like bizarre.